Getting There: Depending on your U.S. departure city, airlines that service Miami include United, TWA, American, and Delta. The 1-800 phone numbers and Web links for these airlines are available at this magazines Airlines page. NCL also provides an air/sea option which includes air arrangements and shuttle transportation at a reasonable rate. For air/sea travellers coming from the west coast, hotel lodging is included for the night prior to cruise departure. 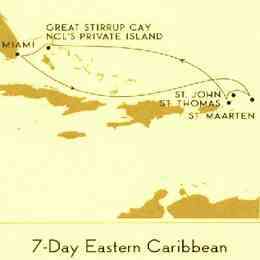 The Norways eastern Caribbean cruise itinerary includes St. Maarten, St. John, St. Thomas, and NCLs private island, Great Stirrup Cay in the Bahamas. The Norways western Caribbean cruise visits Ocho Rios, Grand Cayman, Cozumel, and Great Stirrup Cay. See the maps and itinerary listings below. The Norwegian Stars western Caribbean (1) cruises sail from Houston with Calica and Cozumel, Mexico and Roatan, Honduras as ports of call. 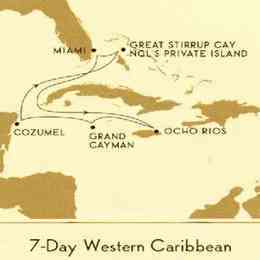 The Norwegian Winds western Caribbean (2) cruise sails from Miami and stops at Grand Cayman, Cancun, Cozumel, and Great Stirrup Cay. Useful resources for these and other Caribbean destinations are Fodor's Caribbean and Frommer's Caribbean, available through the Travel Bookstore. 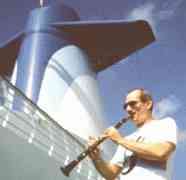 Born into the era of grand ocean liners, the legendary S/S Norway is a very distinctive cruise ship. Originally launched as the S/S France, the Norway displays plush splendor and architectural marvels. After the finishing touches of a three-year refurbishment, the Norway is again young, with hand-laid tile mosaics, painted murals, marble statuary, teak rails, a two-story Broadway theatre, and three clubs, including the magnificent Club Internationale. There is a world-class Roman Spa, a Monte Carlo casino, and a fully-equipped Fitness Center with incredible views. The Norway sails week-long Caribbean theme cruises, and a vaviety of standard cruises with differing itineraries. Norwegian Cruise Lines: cruise descriptions and information.